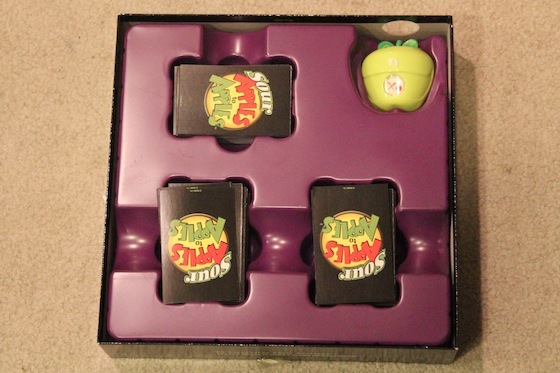 Apples to Apples is a popular card game that is great for a group of people (from 4-10 players) that has won several awards, including the “Mensa Select” award, and the National Parenting Center‘s seal of approval. The neat thing about Apples to Apples is that the rules aren’t complicated, and anyone who can read can play. 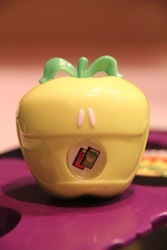 In the original game, there are Red Apple “noun” cards, and Green Apple “adjective” cards. 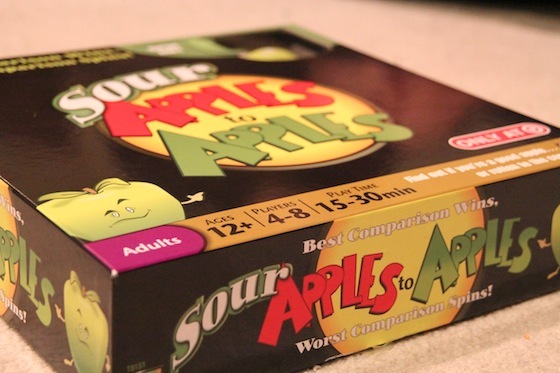 In Sour Apples to Apples, the cards are double-duty and have red apple and a noun on the top, and a green apple and an adjective on the bottom. I think this was a pretty smart design, since with the original game you had to buy expansion packs when you’d played so many times that the words became too familiar or boring, and it will take longer with this version of the game for that to happen. The one snag is that the directions seem like they were written before the designers decided to make the cards with both the red apple and green apple on them, because they keep referring to them as “red apple cards” and “green apple cards” when describing gameplay. A new addition to the game is the “Sour Apple Spinner”. 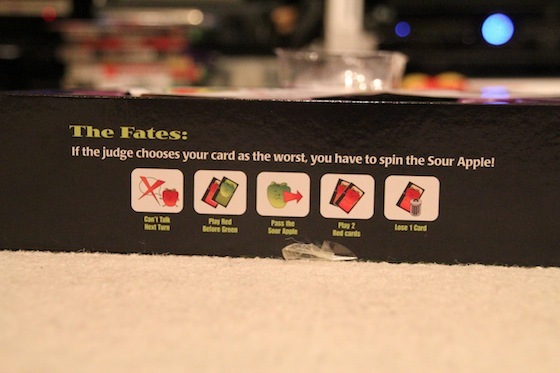 The other difference in Sour Apples to Apples is that the judge is supposed to choose a “best” answer and a “worst” answer, and the person with the “worst” answer has to spin the apple spinner, which can either have a good outcome or a bad one. Some examples are “Lose 1 Card”, where the player has less choices of words to match the upcoming adjectives or “Can’t Talk Next Turn”, where the player can’t lobby for their word being chosen. One of my issues with the game are the dual use cards – they can be confusing when you first learn to play this version. 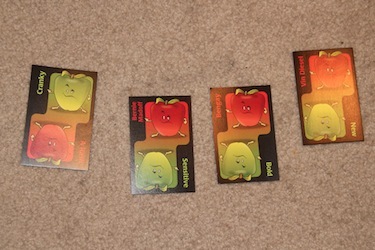 Also, in the original version there were descriptions of the nouns on the Red Apple Cards and synonyms for the adjectives on the Green Apple Cards, which were helpful and kind of fun – one of our players said her high school students wouldn’t have understood who the person was on one of her cards (Bernie Madoff). The other issue I have is that the game has the judge choose the “best match” and “worst match” whereas in the original version there’s just a “winner” chosen, for whatever reason the judge chooses (whether it be the silliest, the weirdest, the most outrageous, etc.). When a “best” and “worst” is required, people tend to think they need to choose the best match based on logical definitions, which shifts the way the game ends up being played. All that said, we still had a lot of fun playing, and we’re playing it again next week! Maddie, if you’re reading this, you’ve been warned!